If you are a real lover of sea mammals such as dolphins and sea lions, then the Nassau Blue Lagoon Trainer for a Day program is the perfect experience for you! This full-day program allows passionate guests to experience an exclusive behind-the-scenes look at what goes on at the Blue Lagoon Dolphin Center. This Dolphin Center is hailed as one of the top dolphin centers in the world! We work with only the best dolphin and sea mammal trainers and we go to great lengths to make sure our animals are happy and well taken care of. With the Trainer for a Day program, you will get the chance to see all that goes on to make sure dolphin programs continue to be rated as some of the best on the planet! The Dolphin Trainer for a Day program starts at either 8:30 or 10:30 in the morning. Each day is different, so no two trainer programs are ever exactly the same! 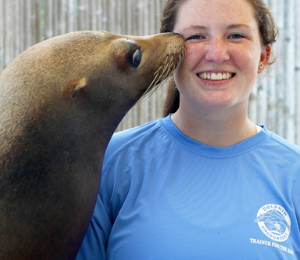 You will meet with our professional dolphin and sea lion trainers and they will take you through the behind the scenes. It’s almost like having an all access pass to our dolphin center! You will learn all about the hard work and dedication it takes to properly attend to these beautiful creatures. The program includes an interactive dolphin experience, as well as an unforgettable sea lion meet and greet. You will get the chance to interact with our animals on a one-to-one basis that you can’t quite get with any other dolphin program in Nassau. But there’s even more that comes with this exclusive package! We are eager to meet other people who are as passionate about marine biology as we are, so we try to treat you like one of the team! You will receive a custom Trainer for a Day shirt along with a lanyard and Trainer ID. You will also receive a custom recycle tote, a personalized 8x10 photo of you with one of our animals, and we even treat you to a Bahamian-style lunch from the delectable Blue Lagoon cafe! This is the type of experience that you will remember for life! Plus, we only invite 4 lucky guests on the Trainer for a Day program each day, so it’s even more intimate and exclusive. But spaces do fill up fast and well in advance, so make sure to get your reservations in early! Cameras are NOT permitted while doing any dolphin or sea lion programs. Observers only are permitted to have a camera. I have been to the Bahamas many times, but Nassau Dolphin Trainer for a Day is one of my favorite trips! It includes everything that everyone should do here. As a Bahamas veteran, I can say only the best about this experience!